Bulldog Bistro is a family-friendly, neighborhood restaurant that is family-owned and -operated. They’ve been around since last November, and their menu has both British comfort foods as well as a good selection for anyone with a discerning taste (Colonial Chicken, Pan Seared Wild Salmon, Buttys, Shepherd’s Pie, Steak & Guinness Pie, Blackened Chicken pasta, burgers, wraps, soups, quesadillas, and salads). The hubs and I stopped by, hoping to pick up some shepherd’s pies, but we were disappointed that on Sundays, only a brunch buffet is served. But, to not waste a trip and to really make use of our stomach space, we decided to give the buffet a try! The spread offered a nice variety! Breakfast potatoes, mini chocolate chip pancakes, pork & beans, sausage links, scrambled eggs, sausage gravy, mini scones, quesadillas, red beans and rice, jerk chicken, blueberry muffins, and a vanilla/chocolate pudding – all were super delicious! The breakfast potatoes were savory, seasoned perfectly, and had a nice crisp on its exterior; the mini chocolate chip pancakes had good batter and was slightly thicker (which I actually loved); the cut-up sausage links were super delicious and quite addicting; the sausage gravy was thick, hearty, and had great flavor; the quesadillas were tasty, and no need for sour cream or hot sauce! ; the jerk chicken had great flavor, and the meat was moist and juicy. I had a nice conversation with Mary Kate, who shared that everything is cooked and prepared by her father, some of the specialties that they offer, and the updates being shared on their social media. All the staff members (who are siblings) are all super sweet, super friendly, and super welcoming; I’d love to talk with the owner on the next visit! I can’t wait to come back and try out their Shepherd’s Pie, the Buttys, as well as the rest of their menu. Be sure to check this cute place out – the locals are so lucky! +all cooked and prepared by the owner! 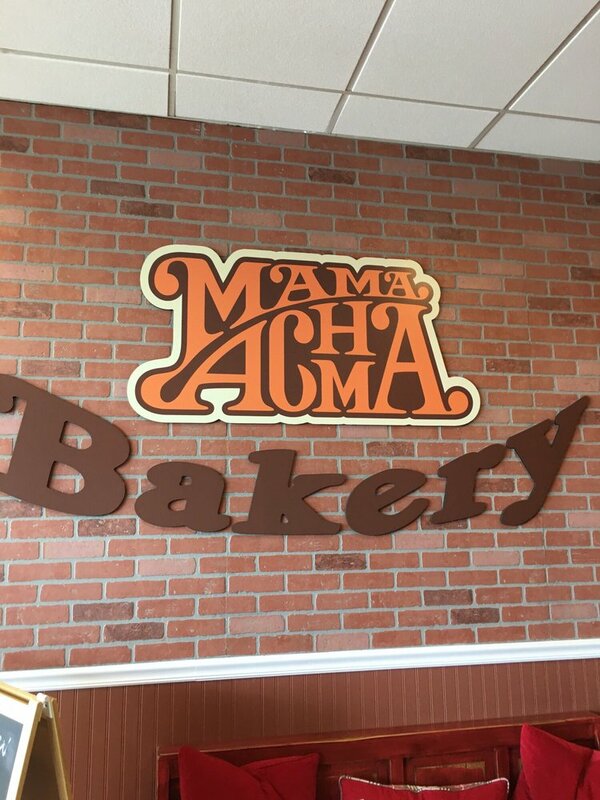 Mama Achma Bakery is a little Georgian bakery nestled in Manassas. 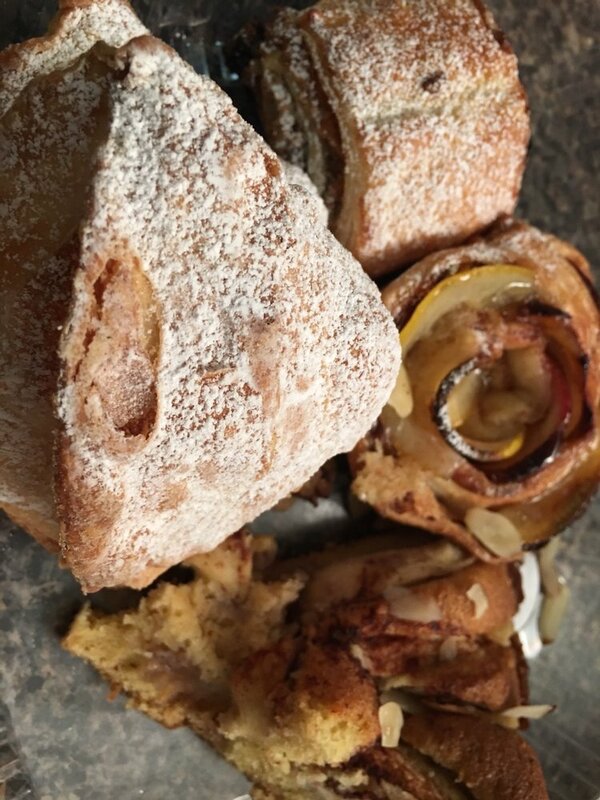 All the fruit cakes, muffins, cookies, pies, pastries, and breads are handmade and housemade, right on the premise, using old-world and family recipes. They even do catering and birthday/holiday/any special occasion customized cakes. The hubs and I stopped by, and I was super excited in checking this place out, as I just had a good feeling about this place! Ms. Catherine, who owns this bakery with her husband, shared us the items that they had and we just had to get literally one of each! We tried a Mama’s almond cookie (made with almond flour, this was the perfect amount of sweetness and pretty tasty; the hubs was a total fan! ); and purchased: a slice of an apple pie (topped with cinnamon and almonds); a fresh cheese boat (filled with cheese and boiled eggs; the bread was nice and doughy, and filled with cheese and chunks of boiled egg); 2 kinds of achmas (a seven-layered dough with cheese and butter, and a beef version made with pulled beef, sour cream, and spices – I really enjoyed the latter); a Sweet Snail (filled with raisins and walnuts); an edible ‘apple’ rose tart (really pretty! ); a ‘Sail’ (filled with chocolate and egg cream); and, a mushroom turnover (that kind of looks like an empanada, these were filled with some sauteed, finely-diced mushrooms; any mushroom lover would enjoy this!). Since everything is made with love and with all natural ingredients, one does not need to worry about preservatives or artificial flavors – you can really taste how fresh each item is! To re-heat, it is recommended to use your toaster oven, rather than your oven. I cannot wait to go back and try out their khachapuri and a raspberry basket, as these items also sound pretty amazing! Check this little gem out! +everything is made on the premise! 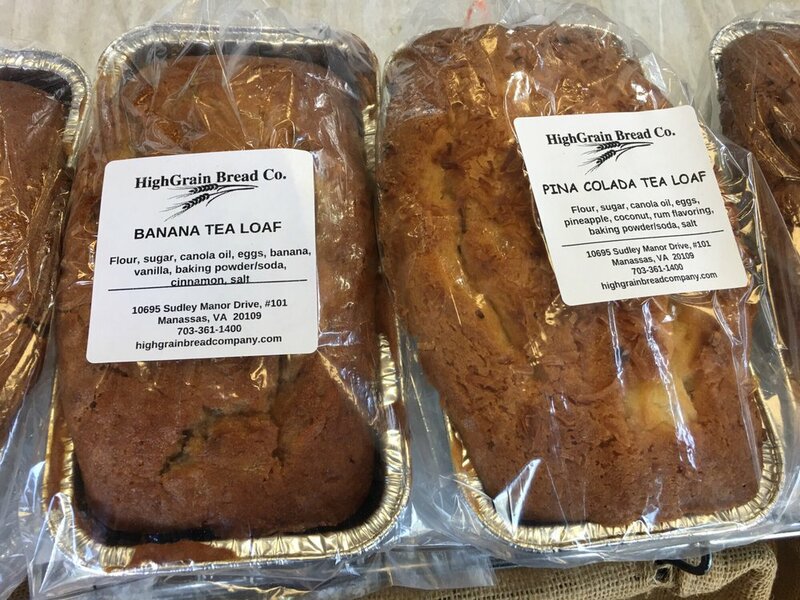 HighGrain Bread Co. (the sign on their store and their labels all states ‘HighGrain,’ but their website and social media has a space between the ‘High’ and the ‘Grain’…) is a bakery located in Manassas. This place makes all the bread and the pastries on the premise and offers breakfast items (breakfast sandwiches and breakfast burritos), hot/cold sandwiches, salads, soups, cookies, tea loaves, walnut brownies, gooey bars, cinnamon rolls, biscotti, scones, as well as a variety of breads (multigrain, olive parmesan, kale & feta, date nut, stollen, rye, pumpernickel, raisin pecan, brioche, Irish soda bread, etc.). They even have freshly-baked dog biscuits! Make sure you check out their schedule, as it features certain specialty items on certain days! 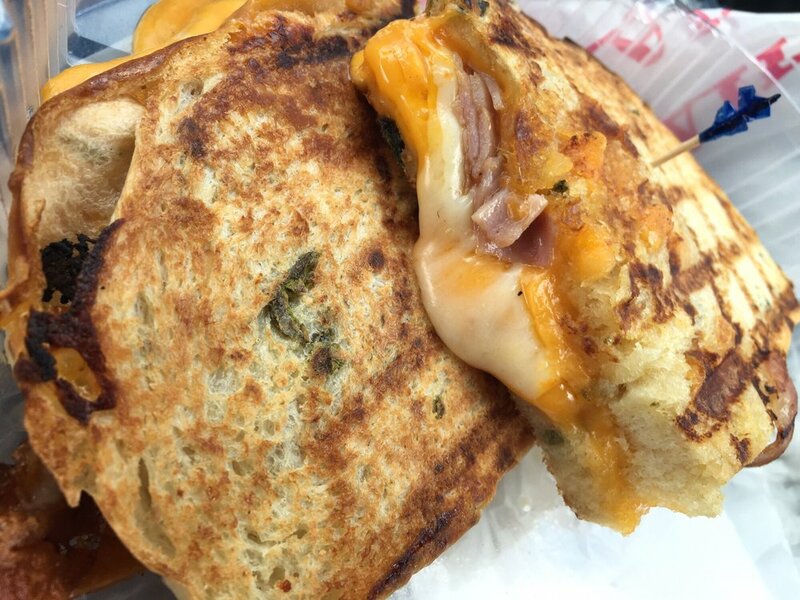 The hubs and I stopped by, and I tried their Grilled Cheese – you can actually choose the loaf you want, so I opted for the Jalapeno Cheese – the grilled cheese was made up of cheddar cheese, American cheese, ham, and chipotle mayo; perfectly panini-pressed, this grilled cheese came out with a nice crisp exterior with an cheesy/gooey filling – it was delicious! Next time, I have to make sure to add some mango chutney (has a slight upcharge)! I also had a chance to try their Pina Colada tea loaf, and this was super delicious!!! The loaf was super moist, fluffy, with a pound cake-like texture, filled with some coconut shavings and a lovely ‘pina colada’-esque taste – sort of reminded me of an upside down pineapple cake! The Banana Tea Loaf was also super moist, delicious, and had a great banana taste, but I actually preferred the PIna Colada version! The employees were super friendly and helpful, and super sweet, especially Christian! I can’t wait to go back and try out their other items, such as the savory scones (available on Saturdays), the breakfast burritos (served starting at 7AM), and the cinnamon rolls (Thurs, Fri, and Sat)! What a find in Manassas! Rivera’s Restaurant is a small little Latin restaurant offering appetizers (such as pupusas, yuca fritas, taquitos, ceviches, etc. ), soups, tacos, pollo a la brasa, fajitas, fish/chicken/seafood dishes, and daily lunch specials. I tried their #38, which was the Lomo Saltado de Carne (you can also opt for chicken instead), that came with a side of yummy fluffy rice and beans. This was an extremely generously-sized plate, with super flavorful sauteed beef strips with red onion slices and sliced tomatoes – this dish was absolutely DELICIOUS!!! The beef was juicy, and the sauteed onions were just lovely! You also receive two bottles of green and the aji sauce. The aji sauce, while more mustard-y, was a perfect pairing for the lomo saltado dish! We also tried a Pupusa de Queso, a cheese pupusa – this was a bit forgettable, as there wasn’t much cheese within, and the exterior wasn’t as crispy as I usually like it to be. The hubs and I also tried their horchata, which was had the perfect creaminess, not-too-grainy, with a nice little kick of cinnamon – very refreshing! One thing I thought was hilarious was that the restaurant had 2 TVs, one playing K-dramas, dubbed in Spanish – it was super entertaining! Service was super sweet and friendly – Ms. Mirna and Ms. Damaris were both wonderful! I’ll definitely be back for their lomo saltado as well as to try out their pollo a la brasa! WHERE HAVE I BEEN FOR THE PAST 2 YEARS?! I never knew that The Sushi Bar had been part of the Del Ray neighborhood for a couple of years now. This small, unassuming sushi restaurant with a small obscure sign, owned by Chef Saran (also known as ‘Chef Peter’, who apparently trained under Chef Hiroyuki Sakai, my most favorite Iron Chef of all time!!!) Kannasute, offers literally one of the best ‘contemporary’/’creative’ omakase that I’ve experienced!!! The hubs and I came here for a little date night, and calling in advance, found out that the restaurant does not take any reservations – first come, first serve. When we arrived, we only waited for about a few minutes to sit at the sushi bar in the back. While waiting, we were served some water as well as the menu to look over. The hubs and I decided to go with the omakase – and, I’m so glad that we did!!! We started off with some authentic Japanese Kobe tataki (!!! ), with some microgreens and a house sweet sauce – slightly seared, the Kobe was cooked perfectly and subtly tasted grilled; Blue Fin tuna with some duck pate and tobiko; salmon belly nigirizushi with fresh ginger sauce; some bluefin tuna tataki with sesame; toro tataki with some garlic ponzu, carpaccio sauce, spicy sesame oil, and schichimi togarashi; and, a tower of fatty tuna, sea urchin, monkfish pate, tobiko, garlic ponzu, and chili lime sauce. The uni/sea urchin was literally one of the most freshest, most creamiest, and the most delicious uni I’ve head in ages – it had such a clean and wonderful taste, I was super pleasantly surprised! The eel? Perfectly grilled and had the perfect ratio of the sauce. None of our plates needed a dip in the soy sauce or anything – everything was perfect seasoned, dressed, and drizzled on! For dessert, we were presented with a black sesame ice cream on a crispy phyllo bird’s nest – super amazing!!! The crispy phyllo nest had a lovely drizzle of honey, and the black sesame ice cream was not too sweet and a great complement – a wonderful way to finish the meal! Each plate was beautifully-presented, creative, had great attention to detail, and all the fish was just super fresh and wonderful – you can really taste the quality! Chef Kannasute and Chef JJ were both super sweet, friendly, and welcoming, and the staff (Kirin, Ashley, and Nathan) were all just super awesome and attentive!!! The hubs and I were both huge fans and really believe that this is literally the best restaurant in VA!!! Even better, the omakase also changes, so just let the Chef know and he’ll always provide a different, creative offering the next time!!! Just note that the sushi bar has only 6 seats, so you may have some wait – however, it’s totally worth it! I also LOVE the fact that this place is 18+, so no screaming/whining kids (there may be some adults doing these acts, but that’s a whole another story AHAHA). The restaurant has a deep red decor, is clean, small, and cozy. Definitely check this gem of a sushi restaurant out – you will NOT be disappointed!!! +contemporary and creative = keep that in mind! +black sesame ice cream for dessert! The menu is pretty extensive, offering their specialty of Honey-Spicy (offered in mild or in hot) and Soy Garlic wings/drumsticks; subs, and appetizers (dumplings, Vietnamese garden roll, etc.). I’d heard about their weekday lunch buffet, so I was curious in checking them out. They have a bibimbop area with delicious banchans (pickled cucumbers, radish, bean sprouts, kimchi, etc. ), as well as spicy dwegi bulgogi, mini fried dumplings, sauteed mushrooms, fried rice, and their signature chicken (drumsticks only). I actually really enjoyed my meal! The bibimbop was really tasty, as the banchans were all deliciously seasoned and yummy; I loved that you can control the amount of sesame oil and gochujang you put in (bottles available at the buffet). The drumsticks, while not my favorite part of the chicken, were still quite delicious!!! Perfectly fried, perfectly coated with the sauce, crispy exterior – YUM! I loved how Mr. Choi, one of the owners, was very meticulous in making sure that the chicken was always freshly-cooked and monitored when there needs to be more delivered to the buffet!!! Talk about quality control! The spicy dwegi bulgogi was pretty good, too, cooked perfectly with the onions. The dumplings were okay, but still addicting. Ms. Vildan welcomed us so warmly and she was super sweet and friendly! The Chois, a husband-and-wife team, were both very sweet, and we got to talk with Ms. Choi for a bit as she shared a bit of history of the restaurant and the family business (the sister-in-law owns the DC location). Definitely will be coming back for them Soy Garlic Wings – the plus side is, while DC’s location is a carry-out only joint, this place has plenty of seats to dine-in! Check this great local business out! The Espositos Italian restaurant has been around in Fairfax since ’82. Some dear friends, the hubs, and I came here to have lunch, and we were all pleasantly surprised! The menu offers items such as Panini al Forno (subs), Frittate (omelettes), soups, salads pizza (in piccola or in grande sizes), antipasti, pasta, main entrees, as well as desserts. We started off with some antipasti/appetizer plates: the Mozzarella in Carrozza (fried mozzarella with anchovies, these were large block patties of lightly breaded mozzarella cheese with a light olive oil/butter sauce – I really liked the salty bits of anchovies that comes with!) and the Zucchini Fritti (fried zucchini; these were super lightly battered, and I personally was not a fan of these; the light marinara sauce it came with was a great complement for the fried mozzarella, though!). For our entrees, I tried their Spaghetti Carbonara (spaghetti with onions, eggs, and pancetta ham – the pasta was cooked perfectly al dente, and the dish was pretty overwhelming in terms of the amount of pancetta! It was a good, slightly salty dish! ); the hubs had the Fettuccine Romana (homemade flat pasta in cream sauce; this could have been more creamier and cheesier, as it was a bit too bland for me) and the Gnocchi Bolognese (potato dumplings in meat sauce – this was literally one of the best gnocchi dishes we’ve had! The dumplings were pillowy-soft, cooked wonderfully, and it had some cheeses in there (but, not too much) that made it perfectly melty and yummy – this dish was delicious! ); the friends had the Spaghetti alla Polpetta (spaghetti with meatballs) and the Linguine Vongole (linguine with clams in tomato sauce). At the end, we enjoyed a delicious tiramisu, that was of perfect temperature – it was creamy, light, fluffy, airy, and had a great balance of the creaminess and the espresso flavors! Our server, Ms. Esposito, was super awesome – she was friendly, welcoming, and made sure that our beverages were always refilled and our dishes were great. This restaurant is definitely a little gem, and I would love to go back and try out their subs, pizzas, and their other pasta dishes. Check this place out! +yummy salad with marinated sliced carrots!!! The Balkan Grill has a nice menu with a variety of items, such as: appetizers (baba ghanouj, hummus, burek (homemade phyllo pastry dough filled with either beef/cheese/spinach/potato & zuchinni); salads; specialties (cevapcici, Bosnia burger (pljeskavica), adana burger, veggie/steak/grilled chicken sandwiches, raznjici (grilled & spiced meat with fries), pikata chicken schnitzel, fish of the day (such as trout and tilapia), and mixed grill platters. They also have desserts, fresh ‘ayran’ yogurt beverages, as well as other Turkish cold beverages in bottles/cans. The place is small and has about 9 seats; two sets of counters and one table that seats 2. Mr. Byron was at the cashier, but he also helps out in the back – quiet, but very kind and friendly! There seemed to be many carry-outs and some were dining in. I ordered a spinach burek, an adana burger, and a beef donor sandwich. I also saw freshly-made baba ghanouj and sauteed eggplant in the fridge and got those as well. 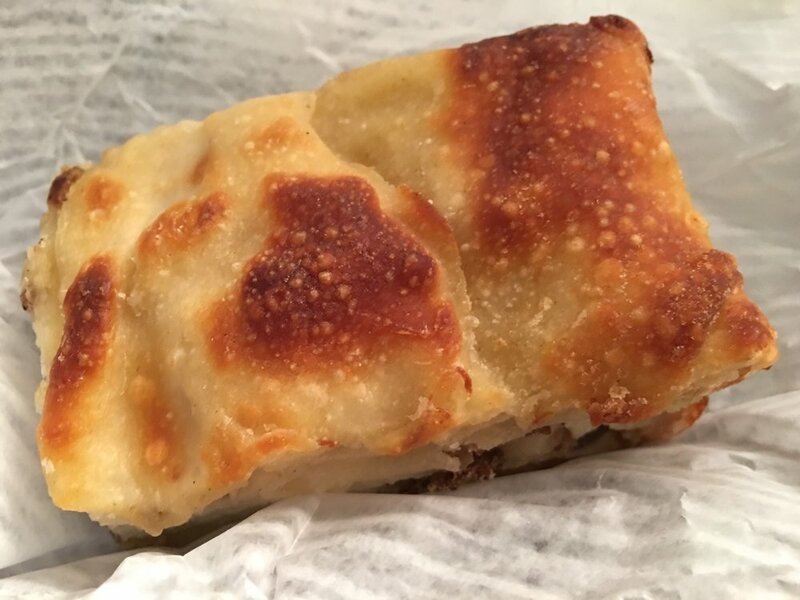 I was slightly disappointed with the burek, as it was cold (I thought it would be piping hot); I’m thinking that you need to be responsible in heating this up in the oven. The adana burger was pretty good – the ground meat patty had a slight kick to it, but it was flavorful; it comes with a side of sliced onions and tomatoes, and there is a yogurt and a hot sauce that you can use to spruce it up. The beef donor sandwich was also good – sliced thinly, like gyro meat, pretty okay flavor, and good with the yogurt sauce. The sliced onions within made it nice and fresh. I really really loved their bread – freshly-baked, right out of the oven, it was nice and soft, and was great in holding in all the meat and veggies. I really enjoyed the sauteed eggplant, as it was tomato-based, but had great garlic/olive oil flavor to it (great with the bread!). The baba ghanouj was pretty okay, and you can tell that it is housemade – it was ever-so-slightly bitter, but it was still okay with the bread. They also have daily weekday specials that comes with a can of soda (Monday is for shish kabobs; Tuesday is for the mixed grill platter; Wednesday is for the pikata chicken schnitzel; Thursday is for the moussaka; and, Friday is the ‘fish of the day’). I am so glad that I was able to check this place out, and I would love to come back and try out the fresh aryan yogurt drink, the Turkish tea, the mixed grill platter, as well as the moussaka. Very cute place, definitely a great little gem in Alexandria! What a gem! Down Home Comfort Bakery is owned by Ms. Maureen and her husband, Mr. Keith. This bakery has only been around a a little over a year, and they offer pies, cookies, brownies, cupcakes, breads, and Garber’s ice cream (a local ice cream company based out of Winchester). When we walked in, we were greeted right away by Mr. Keith. The hubs and I each got a scoop of Garber’s ice cream – I had the Coffee Toffee Crunch (coffee ice cream with bits of toffee throughout; Ms. Maureen asked me if I would like to be topped off with her homemade chocolate sauce – I, of course, happily said YES! The chocolate sauce wasn’t overly sweet, and it was a nice little complement to my scoop. The hubs had the Cookies n’ Cream, and this tasted fresh. We also tried the breakfast bar (recipe of Mr. Keith’s; a granola bar with nuts and berries); an Old-Fashioned Soft Molasses (I liked this as it was nice and soft with a hint of spice); a Fro-Ro (their signature cookie that some toasted coconut and made with oats; also tasty); a sugar cookie with toasted coconut; a cinnamon bun (only offered Fri/Sat/Sun; with a luscious amount of frosting; this was not overly decadent, and I really liked the frosting); a Pecan Sticky Bun (only offered Fri/Sat/Sun; large whole pecans with a nice cinnamon/brown sugar glaze); and, a mini cherry pie (one of the best cherry pies we’ve had, the whole cherries within had a slight tart but still sweet, and the crust was delicious). They also have coffee and tea, and carry local/Amish goods, such as preserves and jams. Such friendly and sweet owners, support this local business – it’s ‘easy as pie’ as their baked goods are fabulous & comforting! I LOVE Crossroads Grill (aka X-Roads)! One of my favorite foods is the Steak and Cheese, so to get my fix, I always drop in at this totally unassuming ‘grill‘ that is located inside a Shell gas station. 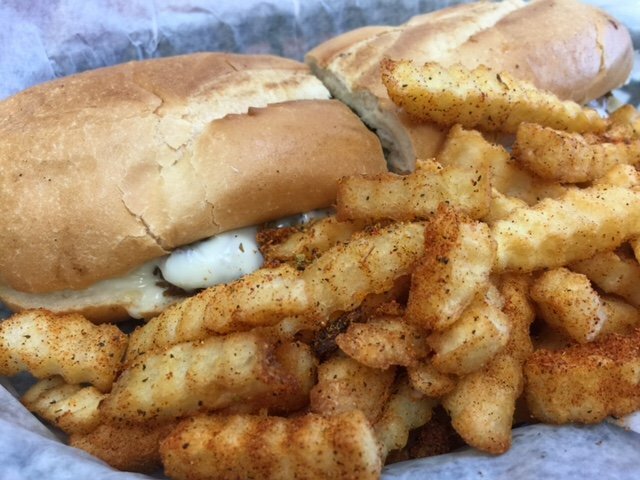 They are always consistent in their Steak & cheese (#15 combo) – the bread is slightly toasted, and it is filled with lovely chopped steak, melted Provolone cheese, yummy sauteed onions, and the tangy zip of the extra mayo (you can also add tomato and lettuce). It comes with a side of french fries (naked or ‘spicy’ (which is like a Cajun seasoning blend on top)). The place gets packed during the lunch hours during the weekdays, and the cashier/chef is always unbelievably sweet and friendly! There’s limited seating within (4 tables – two 2-seaters and 2 corner booths), but you can also do carry-out. When you place your order, you walk to the other side of the food mart and pay at the main gas station cashier, where they stamp it; you then trade in the stamped receipt for the food when the Grill calls out your number. I highly recommend dining in so you get the Steak & Cheese nice and hot (as it can get slightly soggy with the foil, all nestled inside the styrofoam to-go box). I’ve also tried their shrimp basket, which are sooo crispy and generous in the amount (comes with fries as well) – they also offer burgers, burritos, kabobs, and breakfast items. Check them out!